Did you know that April is National Stress Awareness Month? Stress is normal for every living being on this planet, and if can affect your everyday life and health. Common effects of stress can include headaches, fatigue, sleep issues, anxiety, feeling overwhelmed, and more. Here in Howard County we have a lot of ways to combat stress, so if you&apos;re looking for a way to beat stress, we got you covered. Haven on the Lake is a 27,000 square foot retreat that provides an opportunity to escape the stresses of daily life in a welcoming and relaxing atmosphere where you will be inspired to participate in a variety of health enriching experiences. Haven on the Lake offers healing environments, including a crystal salt therapy room, cold plunge, steam bath and more. 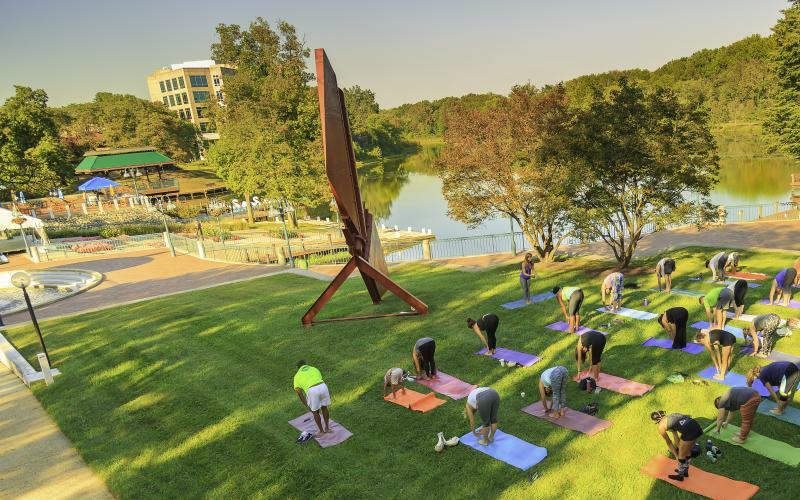 Haven on the Lake also features dedicated Pilates, Heated Yoga and Yoga studios, plus aqua fitness classes. Main Street Yoga was established in February 2017. We are honored to call Main Street in Historic Ellicott City our home. As a yoga studio we hope to offer a class for every body and mind. Our offerings include Beginner Yoga, Vinyasa, Gentle, Kid&apos;s Yoga, Dharma Yoga, Rocket Yoga, Meditation, Prenatal, Yin, Kundalini and Gong. There a several Community Classes throughout the week as well for a nominal fee. MSY also provides water and yoga mats for our students if needed. Awakening your five basic human senses is our pleasure, pride and service. We welcome you into an aesthetically calming space where you select from an array of green tea, hear calming melodies or sounds of nature, enjoy the aroma of plants, candles and oils as you prepare for a stimulating massage treatment. Relax in our unique salt cave to relieve symptoms of allergies, Asthma, sinusitis, COPD, and STRESS. MIGUN infrared thermal massage bed relieves tension. PURE Meditation Studio believes that meditation should be simple and straightforward. We offer classes that are suited for all levels and experiences, without pretense and where all are welcome. Our core classes are secular and based on mindfulness meditation. Join us for guided meditation classes in the morning, evening or weekend. For those who are beginners or just curious about meditation, we offer PURE 101, our Introduction to Meditation class. Located centrally between Baltimore and Washington, DC, The Spa at Turf Valley is an oasis of tranquility. Your transition into the relaxation and renewal experience begins in our calm, comfortable surroundings, with an indoor pool and women&apos;s and men&apos;s saunas. This full-service spa offers a complete menu of soothing massages, facials and body treatments, as well as healthy cuisine, and indulgent day and overnight packages. An outdoor oasis just a hop, skip and jump away from I-95 and the Beltways! Howard County is home to the Patapsco Valley State Park, Maryland&apos;s first state park, that welcomes over 1 million visitors a year! There are lovely lakes and award-winning parks all connected by over 100 miles of paved scenic trails that take walkers, runners and cyclists past wildflowers, wildlife and even waterfalls.